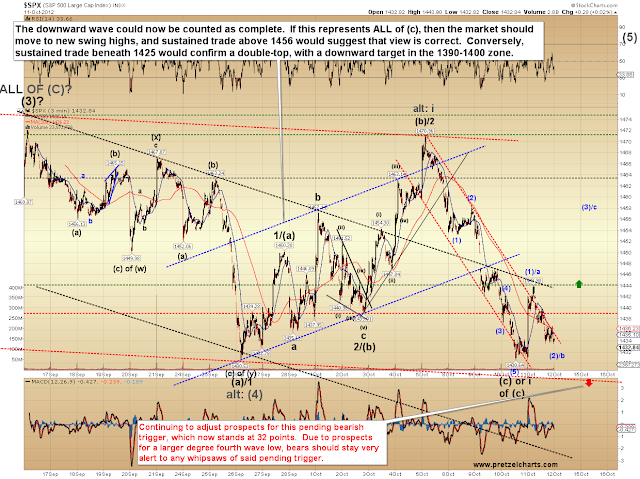 Last update expected the S&P 500 to test the 1425-1430 support zone, which is what's happened since. 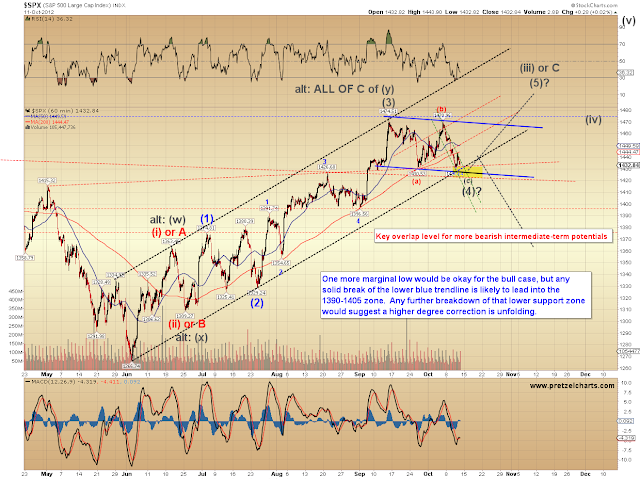 This is now the first real test of the intermediate bull case. My preferred expectation has been that this decline is part of an ongoing correction, and as long as the 1425-1430 zone holds, it should resolve with new swing highs. One more marginal new low would be okay for the bull case, but a solid breakdown of this support level is likely to lead to a 30+ point decline. 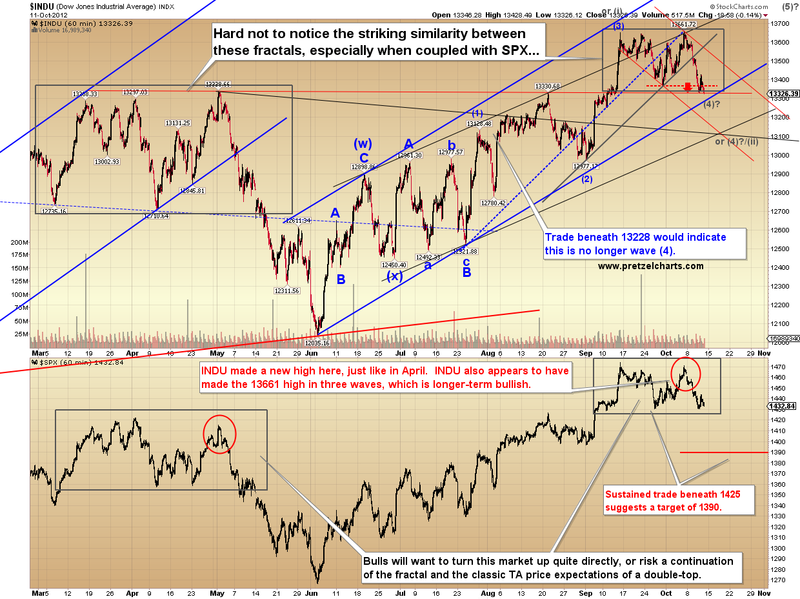 The next chart outlines some key levels for SPX. Finally, one can't help but notice the similarity of the current fractal with the April top earlier this year. If bulls somehow fail to hold key support here, that probably foreshadows a repeat performance. 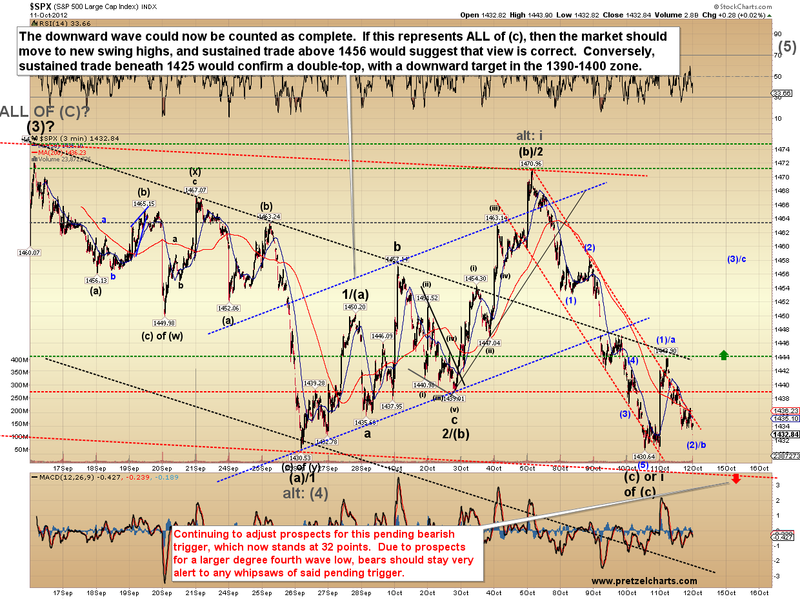 In conclusion, as long as the bulls hold this expected test of support, the market is likely headed to new swing highs. This is where fractal analysis can be a bit tricky to project too far out though, because the current wave down may only mark wave i-down of a larger (c) wave down. This is not my current expectation, but I'll watch the shape of the next rally and note the key levels as it unfolds. Trade safe. 2 things I wanted to tell you that I consider important, and occuring right now, that you might not be aware of (since I have not seen it in any of your daily writings). and I tell you because I am interested in reading what your opinion is on both issues, which I am fairly sure you will also find of interest.1st thing is this---I know you are always discussing the importance of similarities in fractal shapes, whether short or long term. and, what I want to point right out now, is the uncanny striking similarities of 2 other important fractal shapes, lasting approx. 13 months each in both cases (and also occuring from september to october, in both cases)---and it's of the 13 months' fractal of sept.2011-oct.2012, and... the fractal of... sept.1986-oct.1987. take a look at them together, they are very similar, even to the angle of their rising trend channel, and the monthly timing of the primary tops and bottoms, so close that you can nearly overlap the two 13-month fractals into 1 shape.other thing is---according to bloomberg data collection services, s&p500 company insiders have been selling their insider shares by this mid-september, at a ratio of 40 sells per 1 buy.